A Toyota Corolla Altis on display at the 12th Auto Expo in Noida, India, in Feb. 2014. 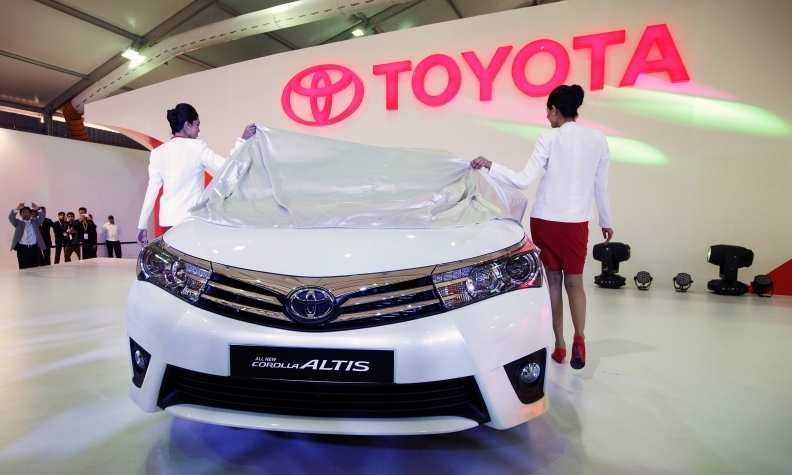 Eight months after Toyota began installing airbags in all its models sold in India, sales rose 19 percent in the period, compared with a 5 percent jump in industrywide deliveries. Toyota Motor Corp. has found that customers don't mind paying more for safety on the world's deadliest roads. For many years, carmakers have been loath to make airbags standard on models in India, worried that higher costs will hurt sales. Yet eight months after Toyota began installing the devices in all its models sold locally, sales rose 19 percent in the period, compared with a 5 percent jump in industrywide deliveries, according to data compiled by Bloomberg. "It's been better than we expected," said N. Raja, senior vice president and director for sales and marketing at the Japanese carmaker's India unit. "Even in smaller cities and towns, people are coming to realize the need for safety features." With only 1 percent of the world's motor vehicles, India accounts for 15 percent of all traffic deaths. Despite such grim statistics, the government has yet to mandate airbags or vehicle crash tests. As vehicle ownership grows, consumers are demanding more safety features, according to J.D. Power and Associates, which measures customer satisfaction. Last year, more than 80 percent of customers in India said they wanted anti-locking brakes and 76 percent wanted airbags, according to J.D. Power. The government is moving to catch up. Improving safety standards on India's highways could boost economic output by 4 percent, according to a road ministry presentation on a proposed new transportation safety bill. The proposed law would mandate harsher penalties for traffic violations and create a centralized licensing authority, as well as a dedicated road safety authority similar to the U.S. National Highway Traffic Safety Administration. In March, the government said frontal and side-impact crash tests would be mandated once testing facilities are ready. In a crash test conducted by the Global New Car Assessment Program and published in 2014, entry-level versions of five of India's popular small cars, including the Maruti Alto 800, Hyundai i10 and the Tata Nano, "vehicle structures proved inadequate and collapsed to varying degrees, resulting in high risks of life-threatening injuries to the occupants," according to a statement from the organization. A follow-up test that included Nissan Motor Co.'s Datsun Go found that the model was so structurally unsound that Max Mosley, the chairman of Global NCAP, wrote to Nissan Chairman Carlos Ghosn and asked him to pull the car off the market. Airbags are now standard in all Nissan-brand cars, and the company will offer optional driver airbags for its Go hatchback this month and its Go+ minivan in "coming months," the company said in an e-mailed reply to questions. Hyundai and Tata Motors didn't immediately respond to e- mails seeking comments on the crash test. While consumers may clamor for more safety features, the extent to which they're willing to pay for them remains a concern, according to J.D. Power. Only 21 percent of the customers it surveyed actually bought variants with airbags and 36 percent bought models with ABS. Customers are willing to pay about 15,000 rupees ($236) to 20,000 rupees extra for a car with airbags, according to Toyota's Raja. "As prospective car buyers work with a defined budget, they often trade off safety features for comfort and convenience features, as the benefits of the latter can be easily and more often realized," said Mohit Arora, executive director at J.D. Power. Maruti Suzuki India Ltd., India's largest carmaker, isn't planning to wait for an airbag mandate. "We are working on adding these features to our cars and will be ready even before the government makes these features mandatory," said R.S. Kalsi, the company's sales chief. "Customers have more paying capacity today."